Black Lace. Refreshingly, Henning resists happy endings, and instead focuses on the richer material of Eileen’s engagement with her conflicting selves, leaving the outcomes of her trials with identity beyond the last page. . . . complex and heartbreakingly authentic (Thomas Haley, Rain Taxi). 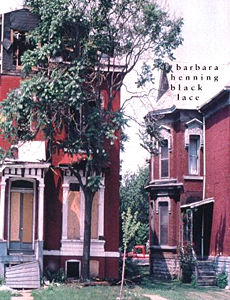 Barbara Henning’s Black Lace is clearly written by a poet, but its prose is straight as an arrow. As third person narrator and I, Henning pins the cut-loose characters of this sparse novel against a gray Detroit dropcloth, connecting them through soul sickness, helplesness, and a scary, uncontrollable eroticism. (Charlotte Carter). Black Lace is a book of ambivalences, shadowy observations and cul-de-sacs, as dreamlikeand harrowing as the fictions of Tillie Olsen and Maurice Blanchot. Barbara Henning’s language is sharp and defiant, as if cut with a stylus. Her Eileen looms out at us, trapped in her sullen self-awareness, wanting everything while reminding us of everything we can’t have. Set in Detroit during the post-Vietnam years, Black Lace has a power of a Depression-era Walker Evan’s photo (Lewis Warsh).